Courtney Towery Tucker grew up in Indianola, Mississippi, birthplace of blues legend B. B. King. After a couple of academically sketchy college years in her home state, she miraculously received her B.S. from the University of Mary in Bismarck, North Dakota, and later her Master’s degree from MississippiCollege. Her chosen profession is clinical laboratory science, but she is a widely published and wildly popular author in her (quite active) literary fantasy life. While her short attention span is tailored to flash fiction, she is currently working on her first novel, which, she proudly proclaims, has “many, many, many pages.” Besides being Karin Slaughter’s #1 fan, she also enjoys Nordic crime fiction, Peeps (all varieties), and light hoarding. WOW: Congratulations on placing in the top ten in our Spring 2012 Flash Fiction competition! What inspired you to enter the contest? Courtney: I love reading the winning entries. It's so interesting to get a glimpse of life through other people's experiences and points of view. Those stories inspire me to try and write from my perspective in my little corner of the world. I'm so honored to have my story chosen as a runner up. After enjoying all of the other stories that made the top 10, I am very humbled that one of my stories is included in such an impressive group. It's still hard for me to believe! WOW: Could you tell us a little about your story and what encouraged the idea behind "Blood on Gardenias?" Courtney: Blood on Gardenias is a letter from a great grandmother to her great granddaughter detailing a family tragedy which occurred several decades before. I'm fascinated by family history and the stories and secrets that are passed down from generation to generation. My grandparents are all gone now, and it's so sad when one of us comes across a letter or a picture from that period of time and there's no one left to ask about it. When I first started thinking about this story, I thought of how wonderful it would be to have a handwritten letter from a grandparent or great grandparent telling about some part of family history that would otherwise be lost. WOW: It was a great concept for a story and you executed it well. I’m always interested in other people’s writing routines. For example, where do you write? How many hours (or words) a day do you write? 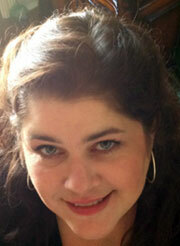 Courtney: I currently write at my dining room table, usually late at night when my boys and my hubby are sound asleep. I'm a night owl, so I'm at my best in the wee hours; which is in direct conflict with my life, since everyone in it is on a day schedule. At 42, though, I'm finding it hard to change! It hasn't taken me long to realize that if you want to write, you have to do it consistently. I once read an article about John Grisham in which he explained how he stays on goal. He writes at least one page a day, everyday. No excuses. If I tell myself I only have to write one page, it takes the pressure off and I usually write a lot more. WOW: Good strategy! Do you have any writing goals in mind for the rest of the year? Courtney: I want to finish my novel. WOW: In your bio you mention some of your favorite things, such as Nordic crime fiction and Peeps, but I have to ask, what is light hoarding? And are Peeps even available more than once a year? Courtney: What?!?!? Bless your heart...of course Peeps are available more than once a year. At all the major holidays, in fact. I only allow myself a couple of packages, though, in order to avoid a full blown addiction. I like them stale, microwaved, broiled...ok, stop it Courtney. As to the light hoarding...if it's limited to one or two categories, doesn't impede access to any areas of your house, or prompt the neighbors to call city officials...I call it light hoarding. I (lightly) hoard anything of sentimental value, and beauty products of all sorts. I freely admit that buying as much makeup as I do and holding on to everything a loved one has ever touched...ummm...it's not even normal-adjacent. Oh well. WOW: You are hilarious! Thanks so much for chatting with us today, Courtney. Before you go, do you have any tips for our readers who may be thinking about entering writing contests? Courtney: Yes...GET THE CRITIQUE! I only recently started getting them because I was too afraid and embarrassed to have someone judge my work. BIG mistake. I have learned so much from the criticism I've gotten. I've been able to correct some significant flaws in my writing. Don't let your fear get in your way. Get all the feedback you can. Thank you so much, WOW!